Accidental Ambassador Gordo by R.C. Harvey. 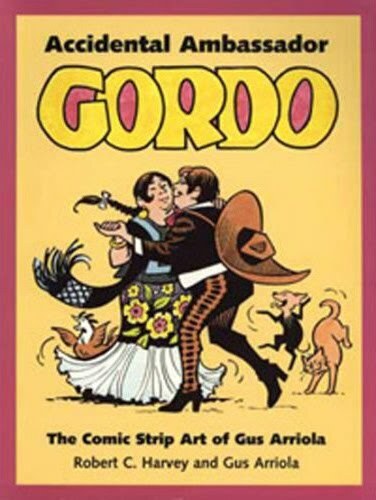 It's basically a biography of Mexican-American comic strip creator Gus Arriola. I had never heard of him or his strip until reading Harvey's history of comic strips. Now, as I hope I'm able to convey through this blog, I have an appreciation for comics by and about other cultures and perspectives. So discovering Gordo was a welcome surprise. Even moreso when I saw how talented an illustrator and storyteller Arriola was. The book contained many beautiful examples of the strip over the course of its 44 year run, many in color. 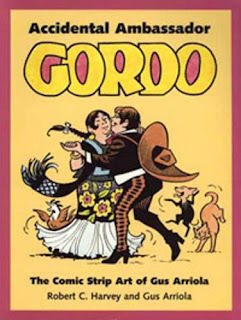 Arriola really looked at the comic strip as an art form in much the same way Bill Watterson did, using design features and color unlike almost every other comic strip artist. I was further appreciative that Harvey spent quite a bit of time working with Arriola for the book. It covered the entirety of Arriola's career with many personal reflections and anecdotes. Plus, Harvey does an excellent job of directing the book, weaving Arriola's insights in a cohesive manner. I think that's often a dangerous way to take things because authors often find their subject's words so precious that they try to include as many of them as possible at the expense of the book's narrative. Harvey doesn't seem to have that problem here, though, and everything flows together quite smoothly. All in all, I thought it was a fantastic book and I was really disappointed to learn how little of Arriola's work is currently in print. Harvey's book had many, many wonderful examples -- the color section in the back was particularly striking -- but this strikes me as being up there with Little Nemo, Pogo and Peanuts where you just can't spend too much time on them.